Last summer, I visited St. Petersburg for the first time, a birthday trip I had planned together with my dad. We spent two days walking around, visiting museums and exploring the food scene of SPB. Our favorite restaurant of the trip was Jerome, a place we happened to stumble upon on our last afternoon. 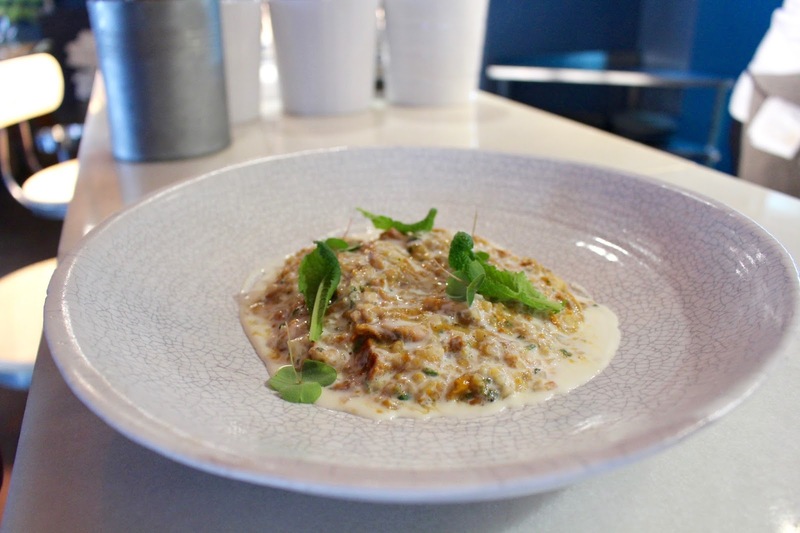 I later discovered that it's part of the well-known and respected Probka restaurant group, so it was no surprise that we loved it. 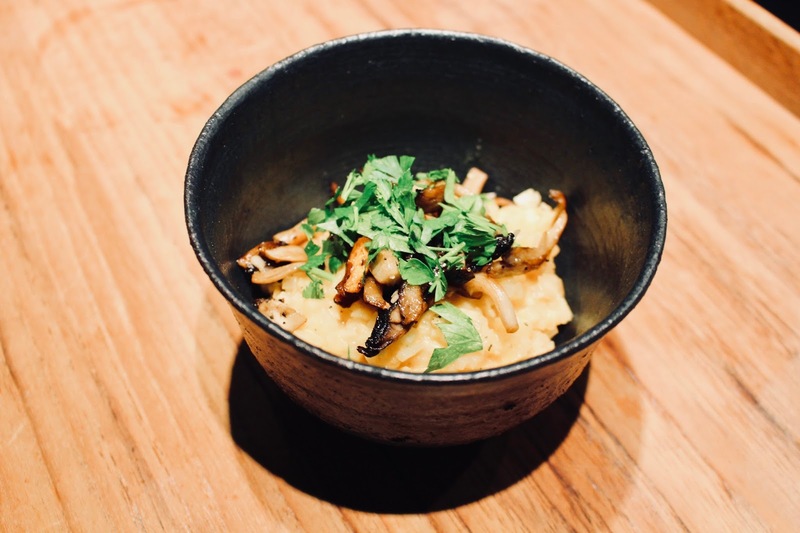 One dish, in particular, was so special and memorable that I immediately wanted to recreate it at home: celeriac risotto. I recreated the dish last winter, without a recipe at hand (because: impossible to find online). It turned out to be delicious, but I didn't write down a single ingredient or measurement. So for my brother's birthday last Friday (because of the amount of work this recipe is not for your average Tuesday night), I made it again. We had it as a starter and everyone loved it, so I hope you will too. It's very satisfying, creamy yet light. One of my favorite recipes I've come up with so far! Note: I decided to keep the recipe completely vegan. If that's not your thing, you can replace the soy cream with real single cream and the nutritional yeast with parmesan. I like using soy cream because it has a bit of a nutty taste which works so well in this dish. 1. 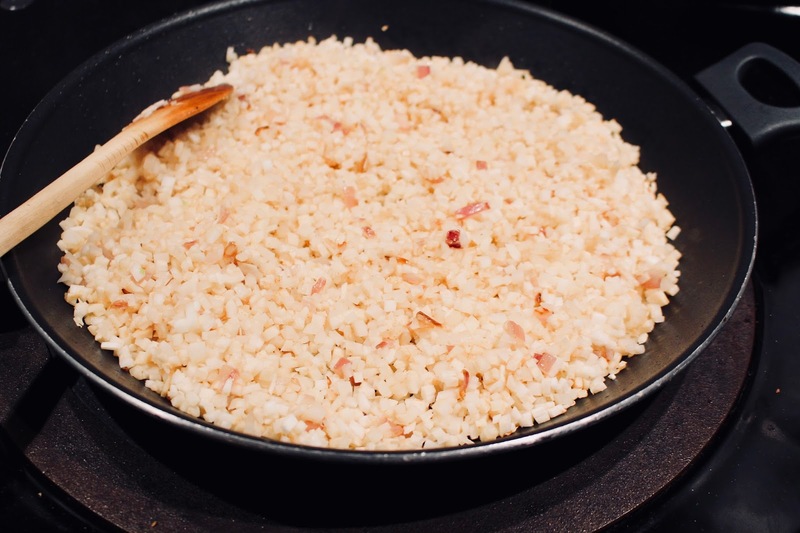 The cooking time of this risotto is much shorter than the real deal, but it's just the preparation which takes a long time. 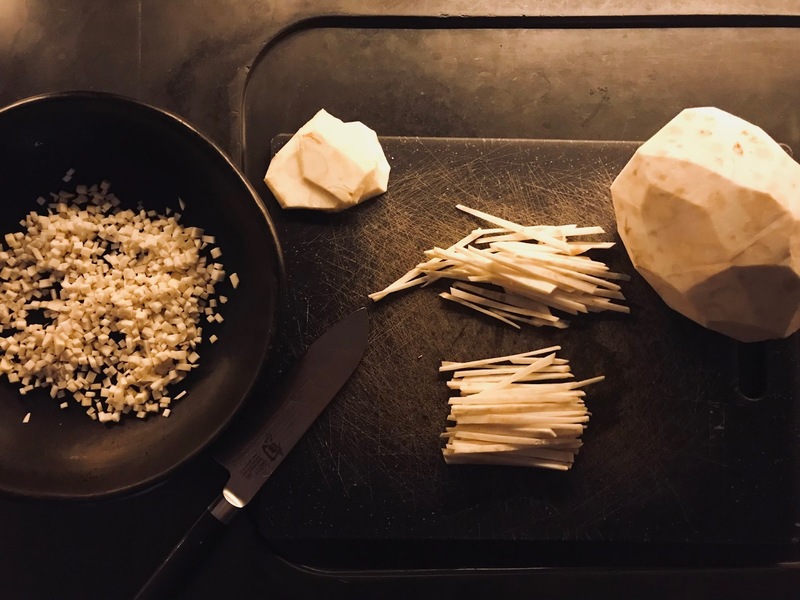 Turning a celeriac root into tiny cubes of rice-like bits is not difficult, but you just need a lot of patience and time. My technique is to make thin slices of the root sideways and then slice those into very thin strips. Then all you need to do is slice those strips into tiny cubes. 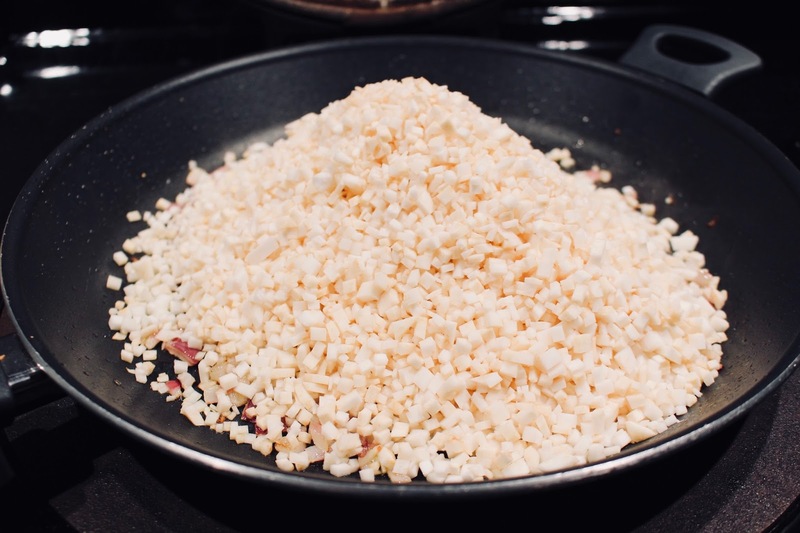 The cubes don't need to be perfect but you want them to be the same size as risotto rice. Very easy, very time-consuming. The first time I did this it took me an hour, this time only 45 minutes. I watched an episode of Stranger Things in the meantime and I can highly recommend it. 2. 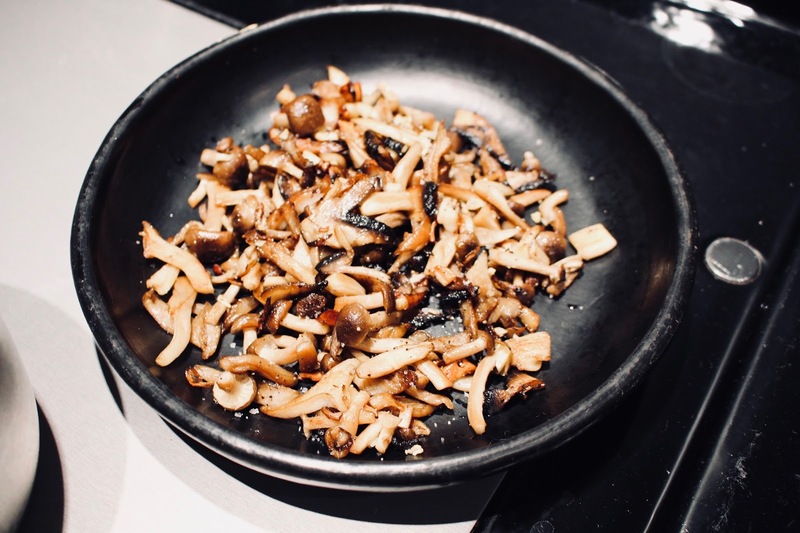 Slice the mushrooms and fry them with a clove of freshly sliced garlic and olive oil in a pan until cooked and slightly crispy. Put aside (I placed them in a low-heat oven to keep them warm). 3. 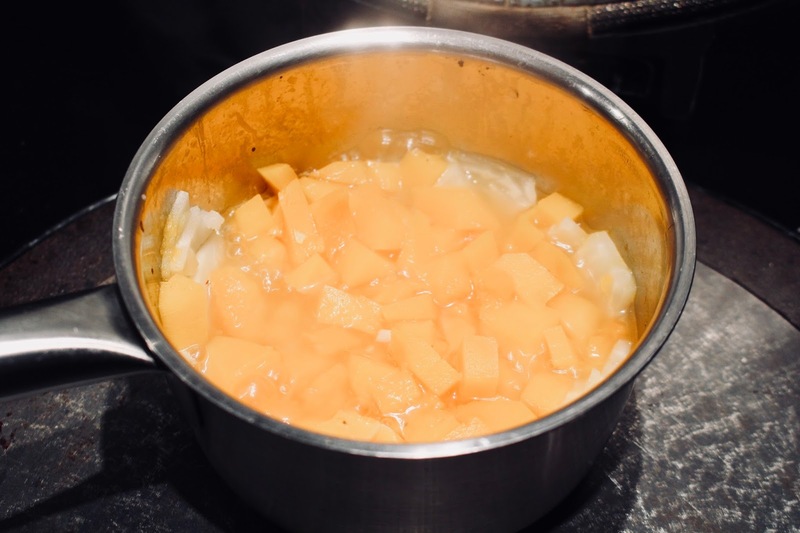 I kept about a handful of celeriac and cubed half of a butternut squash and cooked those in salted water on low heat. Leave this to simmer while moving on to the next step. 4. Fry a thinly cubed onion and a clove of garlic in a pan with some olive oil. Once the onion is soft, add the celeriac rice and fry for a couple minutes, while stirring occasionally. Add a big dash of stock until the rice is nearly covered and a smaller dash of white wine. I did this by feeling so don't remember exactly how much, I think about 500 ml of stock and half a cup of white wine. Let it simmer for 10 minutes on medium heat. 5. 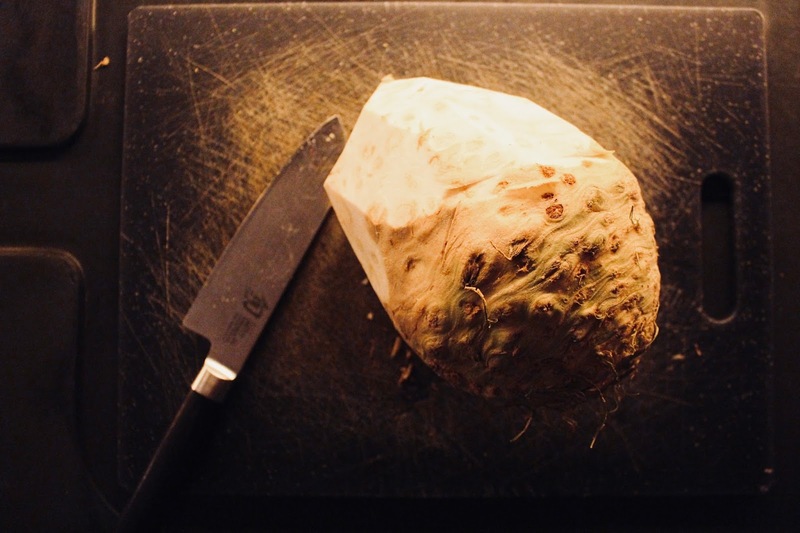 The butternut squash and celeriac should be soft by now. 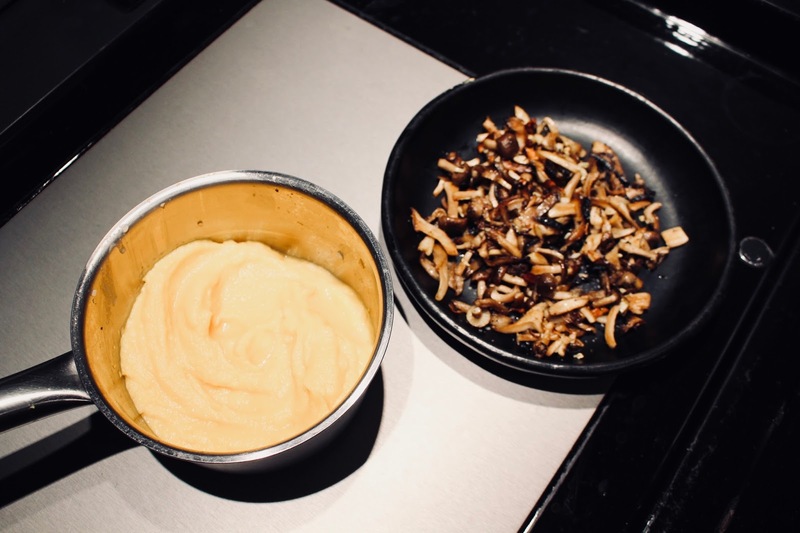 Remove the water, add a glug of soy cream, some salt and blend it with a blender until you've got a smooth puree. This will add a very creamy taste and texture to the risotto. 6. 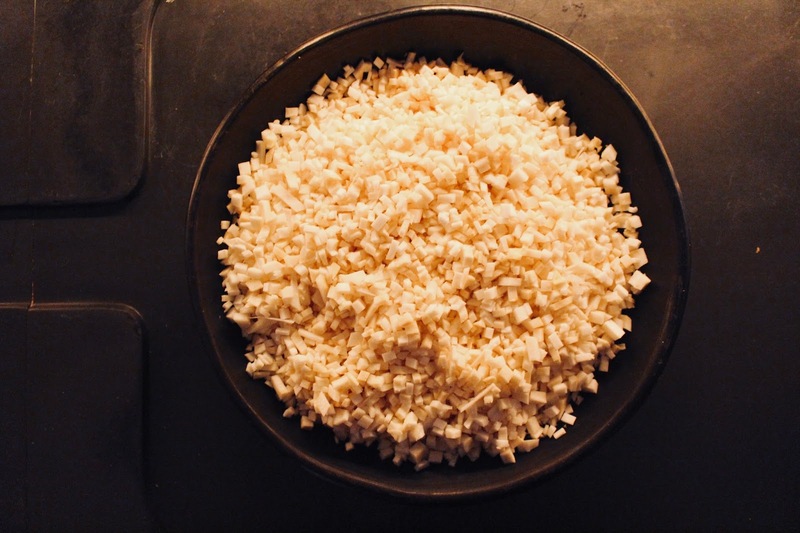 Add the puree, some black pepper, nutritional yeast, and a good glug of soy cream to the risotto and stir to combine. Taste to see if it needs more salt, pepper or nutritional yeast for an extra cheesy flavor. 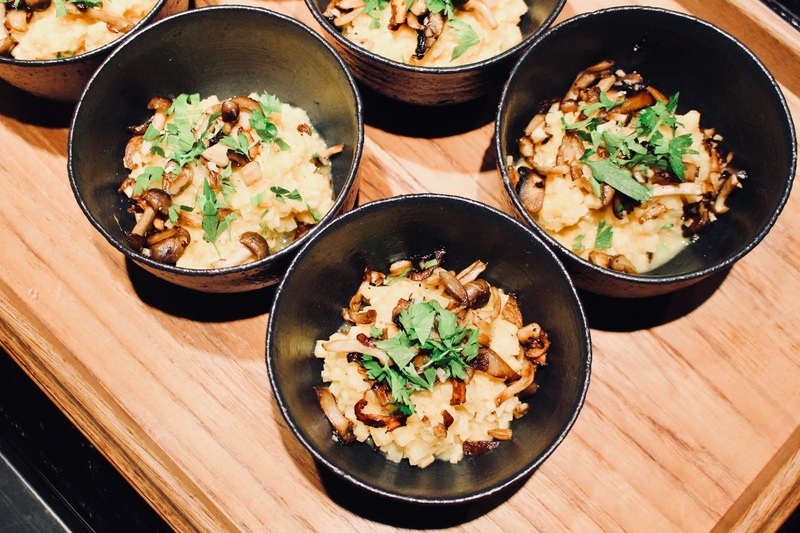 Serve in little bowls, top with mushrooms and some fresh parsley. For the non-vegans, I grated some parmesan cheese on top! 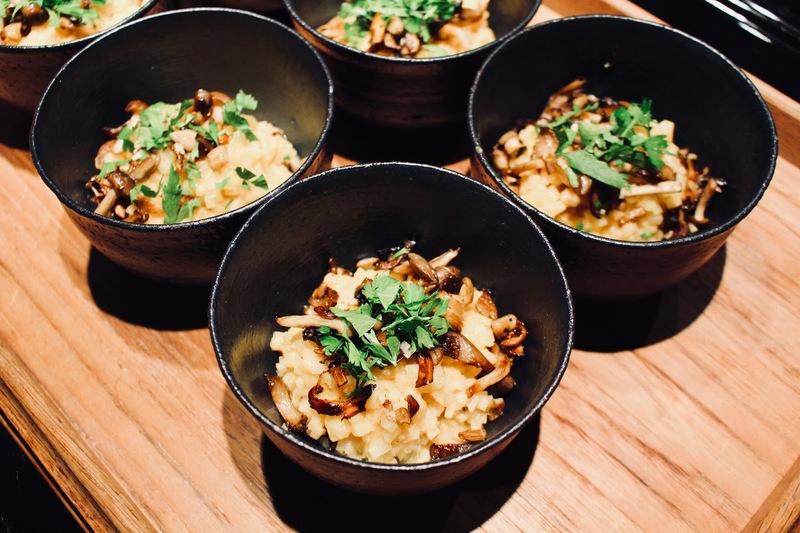 It's the most wintery yet comforting type of risotto I've tried. The best thing about it is that you're essentially eating a bowl of vegetables but it doesn't feel that way at all. Another plus is that I managed to keep the recipe vegan without compromising on flavor (the first time I made it I added parmesan and butter). Unlike most of my recipes, this one is not quick, but the time it takes to make this is so worth it and rewarding in the end! I'll definitely be making this one again around Christmas. It's the perfect starter before a (heavier) Christmas meal!